Chinos are a great alternative, especially for those who despise the look and feel of the formal trousers. Chinos not only look smart but they extend an elegant look, apt to be worn at work as well. And of course, the comfort factor is simply a given! 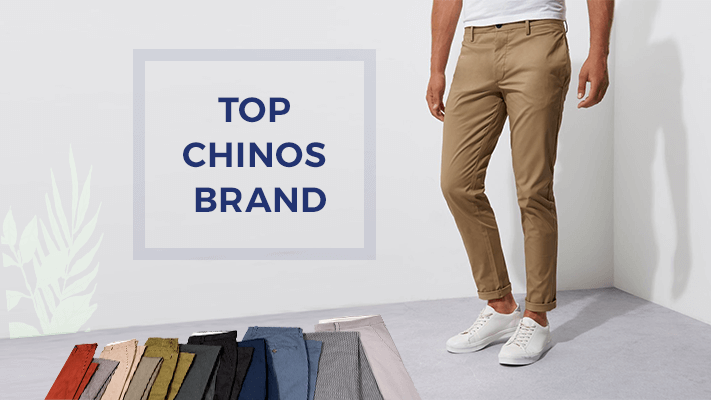 Our in house fashion experts post extensive research and trying out chinos from different companies have narrowed down on top 10 men’s chinos brands in India. The list has compiled based on ratings of the brand on fittings, quality of fabric and pricing. Their annual sales have people queuing up to enter their stores. That is the patronage Jack & Jones has in India and across the globe as well. One of Europe’s leading men’s wear brand, Jack & Jones prides itself in offering a carefully curated selection of fashion forward apparels, accessories and footwear that gel well with modern man. With over a 1000 stores across 38 countries, the brand is one of the most coveted men’s wear fashion brand in the world. 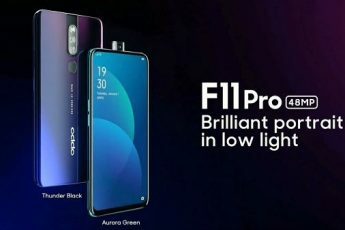 Within India, they have currently 69 stores and a strong online presence as well. 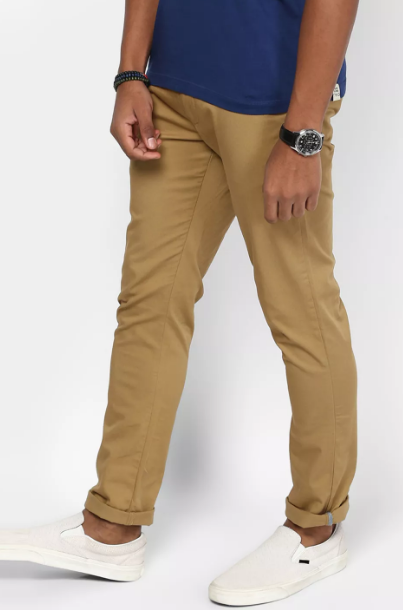 Our pick would be these smart brown chinos from Jack & Jones which can be teamed up with formal shirts and worn casually with a t-shirt as well. A sharp tailored fit gives it an elegant look and the fabric makes it apt to be worn comfortably from morning to evening without any hint of discomfort. From the house of the Indian Tobacco Company aka ITC, Wills Lifestyle has undergone a paradigm shift with offering fashion apparels that are made using 100 % natural fibres. In its new avatar, the brand would now be simply known as WLS. WLS has broken the ground to be the first mainstream Indian apparel brand to embark on a journey of the unhurried art of storytelling and going back to nature. The brand’s design philosophy retains the minimal, understated and sophisticated characteristics that have inspired loyalists for over two decades, while moving in the direction of authentic, India-inspired styles and patterns. A perfect blue that is a must-have for a men’s wardrobe, these chinos can be teamed up with a smart white shirt or t-shirt for that killer look! The 100% cotton fabric makes it an all season wear. Check out the entire range of Will chinos on Myntra and grab them on tempting discounts here. From the house of Aditya Birla Fashion & Retail, Allen Solly was one of the earliest brand to break the corporate wear culture in India. They can be credited for introducing the concept of Friday dressing in India. Understated yet upbeat, their collection is perfect for men who like to look their best always. Besides apparels, they also have a lovely range of accessories for men as well. 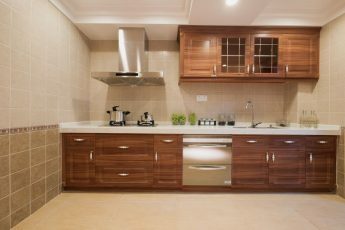 Though they call it brown, it is more on the rust shade side and this is what makes us attracted to it. Quite an unusual shade, these chinos from Allen Solly are perfect to be carried while on a holiday or out with friends for a casual evening get together. Check out the entire range of chinos from Allen Solly on Jabong here. Needing no introduction, Levis set the trend for denim bottoms in India and it continues to do so as well. Once a Levis fan, always a Levis fan! Though the brand has been facing stiff competition from all the new age brands, it still holds a strong patronage in India with first time denim wearers aspiring to own a Levis as part of their wardrobe. Besides denim bottoms, they have an exciting collection of chinos as well. Who needs black formal trousers when you can lay your hands on something as exciting as these! These black slim fit chinos from Levis are designed to be worn at work and play, both. With 100% cotton supporting the make, these would be your all time favourite chinos for sure. Myntra has an entire range of Levis trousers click here to visit. Another coveted men’s wear fashion brand from the house of ITC, John Players is for young men who work hard and party harder. 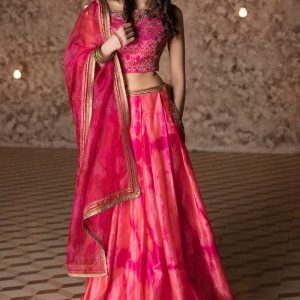 In a world of fast fashion, they are committed to positioning themselves as the number one youth fashion brand in India. With a strong offline and online presence, John Players is fast catching up across the remotest locations in India where youth aspire to dress fashionably. For men who like to experiment with different shades, this one is sure to attract them. In a shade of green, these chinos can look quite stunning if carried off well. Team it up with a jacket and loafers to get that envious glances from other men around who still seem stuck with their age old jeans / cargos. Check out the entire range of bottoms for men by John Players here. A completely Made in India brand, Blackberrys is one of India’s premium men’s wear brand that has its roots deep entrenched in the bylanes of Chandni Chowk. In their 25 year-old journey, they have evolved to include formal, casual and occasional wear for men. The rich cotton stretchable fabric extends a fantastic fit to these chinos and the brown shade is apt to be teamed up with a host of different coloured shirts / t-shirts. Featuring button closure and trendy trims, the pockets on the front give these chinos a perfect casual look. Check out the entire range of Blackberrys trousers at Lifestyle Stores online here. Get Lifestyle Store Coupons on GreatBuyz for your Online Shopping. From the house of Raymond, Parx has been positioned as a premium casual lifestyle brand targeting shoppers between the age group of 22-30 years. A relatively young brand, Parx has managed to get the pulse of the new age consumer and their line each season reflects the same. From chinos to denim bottoms to khakis and cool shirts and t-shirts, they have it all! For men who can carry light colours, especially in bottoms, these grey chinos are simply a must have! 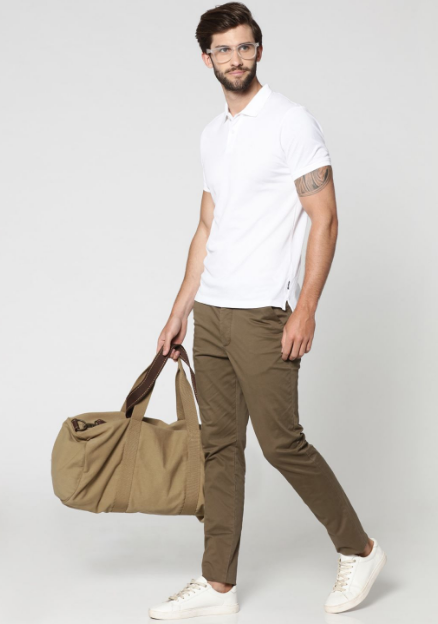 Designed using 98% cotton and 2% elastene, the fit given to the chinos goes well with both shirts and t-shirts. The woven weave type and low rise slim fit make it apt for men who like to dress up in style, even if it is for a casual evening out. Amazon has a range of chinos by Parx on great deals here. A brand that is heavily endorsed and supported by Bollywood actor Salman Khan, Being human has been exponentially growing since its inception. It has been positioned as a brand that is not only about looking good but also doing good. A clothing line with a heart that has made its mark in 15 countries around the globe in just 7 years since its inception, the brand is under Being Human – The Salman Khan Foundation, a charitable trust devoted to education and healthcare initiatives for the underprivileged in India. 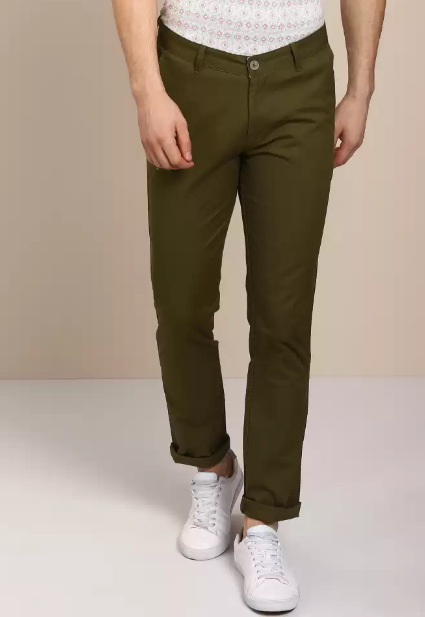 A khaki shade is a must have for a men’s wardrobe and these chinos from Being Human fit the bill. With 98% cotton and 2% Spandex, these chinos give a comfortable fit and the shade of course is perfect to go with almost anything you choose to wear. Wear them to work or team them up with a funky t-shirt for occasions when you want to let your hair down, they will simply not let you down! Check out the range of Being Human chinos here. Follow Shoppersstop Streamz on GreatBuyz to stay updated to their latest news, sales,offers and more. With more than two decades of experience of dressing men, ColorPlus from the house of The Raymond Group offers men’s wear with a sharp focus on unique colours. The brand has a strong patronage from the trend-savvy men who are fond of experimenting with their wardrobe a range of exciting colours and in-trend prints. Depending on what you wish to team up with, either a shirt or t-shirt, these smart navy blue flat front chinos from ColorPlus will suit the occasion – whether formal or casual. The cotton lycra and the check print of the chinos make them stand out from the rest. We strongly recommend these as part of your trouser collection! A global men’s wear brand, Celio has a European inception. With a strong presence in 60 countries across the globe, the brand has become synonymous with understated style that has a rich and classy look to it. It revolves around key themes of Urban, Free, Smart and Essential, with silhouettes under each theme. We end with these super casual chinos from Celio that would surely be your favourite pick if planning a holiday or a weekend getaway. Considering they are designed using linen, we do not really have to elaborate on the look they extend, just four words would be enough – super cool and super comfortable! Follow TataCliq Streamz on GreatBuyz to stay updated to their latest news, sales,offers and more. Get TataCliq Coupons on GreatBuyz for your Online Shopping. Buying a perfect bottom wear is always a challenge – be it for men or women. Besides the fit, the comfort factor too plays an important role as being stuck in something that causes discomfort during the day is ruining the day to bits! Chinos offer super comfort considering the fit is designed keeping in mind the need to feel relaxed – whether it is at work or play.